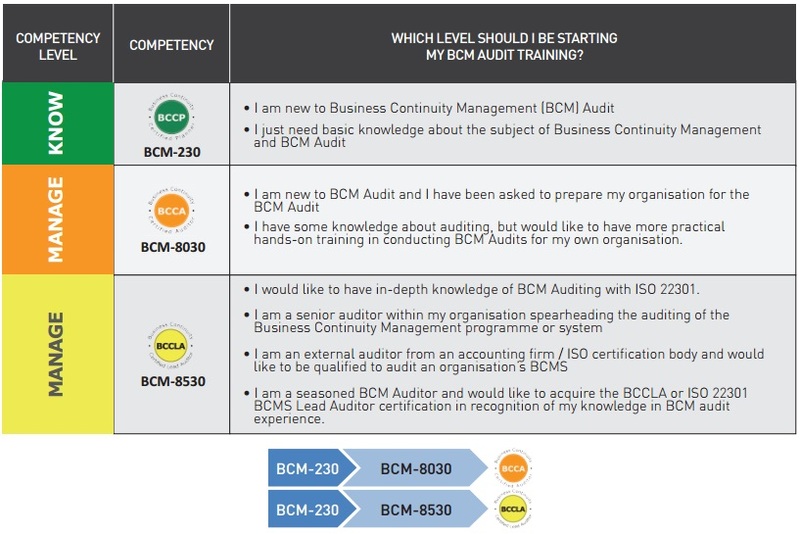 BCM Institute’s ISO 22301 business continuity management system (BCMS) audit certification courses are internationally recognised. It will take participants through, not just on the requirements of standard but it also allows them to understand the fundamentals of BCM that makes up the core of the standard. Participants will also be exposed to the thought processes of an ISO 22301 auditor. If you are an IT and financial auditor wanting to specialise in auditing your organisation’s business continuity management program, this course will allow you to understand and be trained to perform a comprehensive audit. The difference between the 3-day ISO 22301 BCMS Auditor course and the 4-day ISO 22301 BCMS Lead Auditor course is the ability to understand an external, third-party certification auditor’s thought process during the extra day in class. BCM professionals who would like to gain an understanding and upgrade their competency of BCM’s unversal standard, the ISO 22301 and at the same time be internationally certified can look forward to enrolling in any of 2 of our certification courses. This is a 1-day basic course on business continuity management (BCM) best suited for someone who wants to have a cursory understanding of the subject. This 3-Day ISO 22301 business continuity management (BCM) auditor course ensures you have the basic understanding of BCM via the ISO 22301 BCMS Planner course. Once the basic is established, participants will be taught to understand the ISO 22301’s structure and programme element. There will also be audit fieldwork that allows one to immerse in a day of a BCMS auditor and use their understanding of ISO 22301 requirements for audit purposes. This is an advanced 4-day course for auditors who would like to know more about providing BCMS audit for external organisations or join a certification body and work as a lead auditor. While the first 3 days of the course shares the same syllabus as the ISO 22301 BCMS Auditor course, the last day of the course would address the competency needed for an ISO 22301 Lead Auditor. Hands-on exercise would focus on writing non-conformities, audit report as well as conducting and exit/closing meeting as well as reviewing corrective actions and providing audit follow up.